Things are getting exciting at the San Manuel Amphitheater!! Of course, we’re talking about Kid Rock on his The Red Blooded Rock N Roll Redneck Extravaganza Tour! He’s joined on the road by country star Brantley Gilbert & Wheeler Walker Jr AKA Ben Hoffman! No fan of any of these acts can afford to miss it! It’s all happening Saturday 25th August 2018 – get your tickets NOW! Kid Rock, otherwise known as Robert James Ritchie, became active on the music scene in 1990, with his debut rap album "Grits Sandwiches for Breakfast". As time went on he became known for using more musical styles in his work, incorporating hip-hop and heavy metal as well as rap into his songs. With his song “Cowboy" he is widely credited with having helped bring about and popularise the genre of “country rap”. Since his "Born Free" album of 2010, Kid Rock went for a more country sound, and more or less stuck to country ever since. His most recent album is “Sweet Southern Sugar,” which hit the top 5 of the Billboard Top Country Albums chart. You’re bound to do that at the show!! 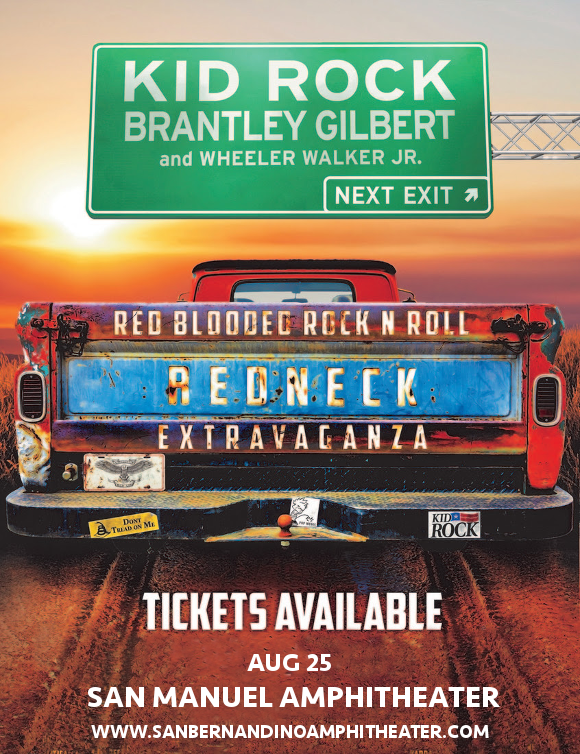 Don’t delay – get your tickets for Kid Rock, Branley Gilbert and Wheeler Walker at the San Manuel Amphitheater today, before they disappear! !